What, you may well ask, is Aspen Visions? It's apparently a new mini-series that places well-known characters from that company in decidedly different settings. 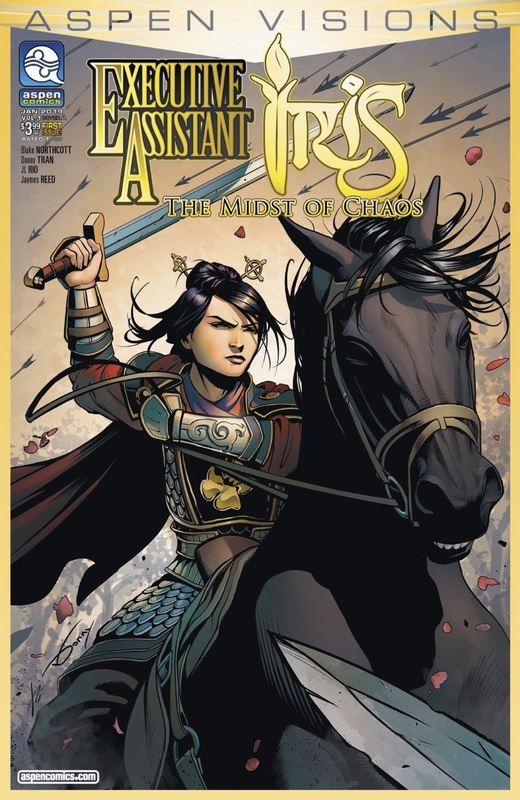 This first issue, for example, drops Executive Assistant Iris in Ancient China, fighting what seems to be a never-ending mob of invading Huns. That's business as usual for our favorite killing machine, as she calmly dispatches an army of invaders - and faces down a dragon. There are, of course, twists to the story that are effective (if perhaps a bit well-worn by now), and the art is excellent. The story is continued into the next issue, which features the company's mainstream star - and lots more trouble for our heroes.